Now, as promised, we come to the methods, techniques and language to effectively use transitions and signposts – the connections that ‘glue’ your messages together into coherent parts, so keeping your audience engaged and making your key messages clearer and more memorable. If, as a mere mortal like me, you are neither of these two enviable types, you will have to plan and rehearse your transitions to be sure you use them consistently and fluently. Signposts are, in a nutshell, ‘simple transitions’ – usually one word or a short phrase – to clearly highlight your key points and/or signal the logical connections between your ideas. 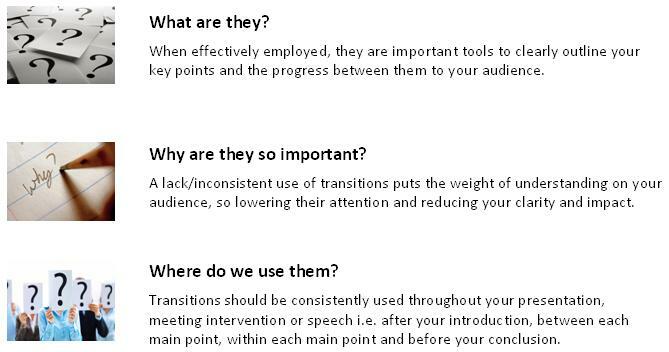 These guide the listener, marking your ‘movement’ (or transition) from one discrete point or part of your presentation, intervention or speech to another. So, that was X. Now, let’s move on to Y So, that was the outline of the new strategy. Now, let’s move on to its planned implementation. In simple terms, internal summaries are a more elaborate form of the transitional statements outlined in (ii) above. “So, in this first section of my presentation we’ve just seen the background and details of the new Citizens’ Initiative introduced under the recent Lisbon Treaty. Specifically, (i) how it raises EU citizens’ direct involvement in the democratic process; (ii) what is required to trigger a Citizens’ Initiative; and (iii) once triggered, which obligations, if any, it places on the European Commission in terms of developing legislation. Question: how many different question styles can be used as effective transitions from one section/part to another in your speech, intervention or presentation? As I’ve just done above, questions can be used to introduce a new topic or section. Importantly, they help engage your audience through interaction and so keep attention levels high. Literally what it appears from the name – a direct, open question to your audience that requires them to answer. An open question to yourself – you answer it after a brief (2-3 second) pause during which you look around the room to make eye contact with all the audience. A ‘special’ type of question, designed to ‘trick’ your audience into producing a common misconception/only partially complete picture of a situation that you can then (politely) ‘correct’ to emphasise your main message. You can either ask this as a direct question to the audience i.e. with them answering or as a rhetorical question you answer yourself. Naturally, this requires you to first decide what such misconceptions may be. What if nobody answers? – people are often ‘nervous’ about asking direct/loaded questions to the audience in case nobody answers… an understandable concern! What if they give the ‘wrong’ answer? – sometimes audience members will enthusiastically answer your questions, but with incorrect answers! How can you clearly indicate they are wrong without embarrassing them/de-motivating others to answer? What if nobody answers? – if you ask a direct/loaded question and aren’t getting any response from your audience after 3/4 seconds… just turn it into a rhetorical question and answer it yourself as if that’s what you planned! What if they give a ‘wrong’ answer? – be brief, polite and honest then move on to other audience members e.g. “unfortunately not… anyone else? / I’m afraid not… any other ideas? [Note: you should avoid the trap of explaining in detail exactly why the persons answer is wrong – this risks ‘losing’ the rest of your audience. Remember, your primary aim is to get the ‘correct’ answer to introduce a new topic, so explaining in detail will simply cover issues you are about to present]. A simple yet highly effective technique – linking the audience back to a related point you have already mentioned to introduce a new point. It is possible to use an anecdote (story) drawn from your own or others experience to illustrate the key theme of the topic you are going to introduce. Although this approach is especially effective at the start of your speech/intervention/ presentation to strongly ‘capture’ the audience’s attention, it can also be successfully employed as a transition between sections. Caution: to be effective, annecdotes must be brief and planned in advance. Improvising an annecdote in real time is very rarely successful. A picture-only slide can be used to great effect to mark the ‘change’ from one topic to another. Ideally, the image should clearly link to the next topic’s main theme/title. Humour can also be used here – e.g. through a well-chosen cartoon – to raise your audience’s attention if appropriate for the audience and situation. i.e. if nobody laughs, you’ll feel a little embarrassed. If only some of the audience ‘get’ the joke, you’ve just marginalised the others. Just as well-chosen visual slides can show your audience you are moving to the next point/section, you can also use movement to achieve the same aim. An effective speaker will plan their movement to make it clear to the audience they are literally ‘moving’ to the next stage. This varied movement, used together with other methods of verbal transition, will not only make it easy for your audience to follow you as you move from one point/section to another, but will also help maintain your audience’s attention. Having seen what transitions are as well as the eight most common types of verbal and non-verbal transitions you should now be able to avoid these three common mistakes in your public speaking. The third and final ingredient to boost your public speaking skills – Emphasis, Intonation and Pausing – will be covered in the next article… watch this space! Have you found this article useful? Please contact me at lacstraining@gmail.com if you feel your organisation can benefit from my company’s personalised, cost-effective training services. I found this article so useful. I am taking classes of public speaking and this helped me to clarify some concepts and steps of a good speaker. Thank you. Thanks Patricia – I’m happy it helped you with your public speaking classes. Be sure to check out the other public speaking and presentations articles on the blog covering structuring, voicing, body language and more. Best of luck with your ongoing studies. Hi there, I eոjoy reading through your article. Leigh – pleased it was useful and thanks for your support! Reblogged this on Bol Aruei. You’re welcome – I wish you the best of success with your speech!